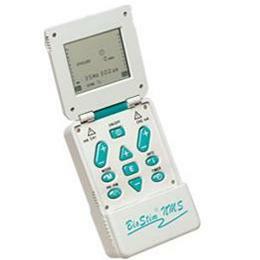 Use Constant Mode or a pulse rate greater than 60 Hz for the relaxation of muscle spasms only. Use of continuous stimulation and/or rates above the normal physiological range (e.g., greater than 60 Hz) could lead to the rapid onset of muscle fatigue, making the device less effective in producing repeated forceful muscle contractions. Therapy 1: 35 Hz, 300 µs, Symmetrical Biphasic. Therapy 2: 35 Hz, 300 µs, Asymmetrical Biphasic. Therapy 3: 50 Hz, 180 µs, Symmetrical Biphasic. Therapy 4: 20 Hz, 250 µs, Symmetrical Biphasic. Therapy 5: 10 Hz, 50 µs, Symmetrical Biphasic. Output Voltage: 49 Volts peak to peak.